This week we look at how Carnival Corp & plc’s investigation into developing a new two-berth cruise port at Haiti’s Tortuga Island, together with its Amber Cove development in the Dominican Republic, take us back to the 1930s. Both are on the island of Hispaniola and relatively close to Miami, especially in these days of high fuel costs. We also look at how Pullmantur is extending its reach far beyond Spain, while at the same time watering down its much-vaunted “All-Inclusive” plan. Finally, for a change, we review Bill Miller’s most recent book, “Great French Passenger Ships,” just published by The History Press. Back in the 1930s, many cruises called on the island of Hispaniola, at either Port-au-Prince or Cap Haitien in Haiti or Santo Domingo or Puerto Plata in the Dominican Republic. Kingston, Jamaica, and Havana were the other regular ports of call for these early 7-night cruises from Miami. All these ports had the advantage of being close to Miami, which kept to a minimum the amount of time it took to get there. Carnival Corp & plc recently announced a potential plan to build a $70million cruise port off Haiti’s northwest coast, that would put three of its own destinations, totalling six berths, within a hundred nautical miles of one another, something that would allow a range of itineraries within fuel-saving distances from Miami. When US-based cruise lines are allowed to sail to Cuba, even more fuel-economic destinations will become available. Besides Haiti’s Tortuga Island, where the Carnival group has indicated its latest interest, the other destinations are Grand Turk and Amber Cove near Puerto Plata in the Dominican Republic, which is scheduled to open in 2015. Both Amber Cove and Tortuga are on the island of Hispaniola, and in fact Tortuga was pointed out to cruisers in the 1930s as a favourite haunt of pirates, in their time. Although Tortuga is not a particularly small island, Carnival describes it as offering white sandy beaches and a desert-like interior with cacti. In the 1930s, the attractions in Port-au-Prince included the Champs de Mars, the “pretentious” Presidential palace, Government buildings, the Cathedral and markets and the winding assent to the mountain village of Petionville. For the more adventurous there were the Sans Souci Palace of King Henri-Christophe of Haiti and the Citadelle, both near Cap Haitien. Haiti was also known for Voodoo, a mystical religion brought to Haiti by slaves from Dahomey, whose descendants comprise the majority of the population. However much tourists were interested and discussed the practise, however, it was largely private and public Voodoo dances only took place on Saturday nights, when their ships were departing Miami. That is the French side of Hispaniola. 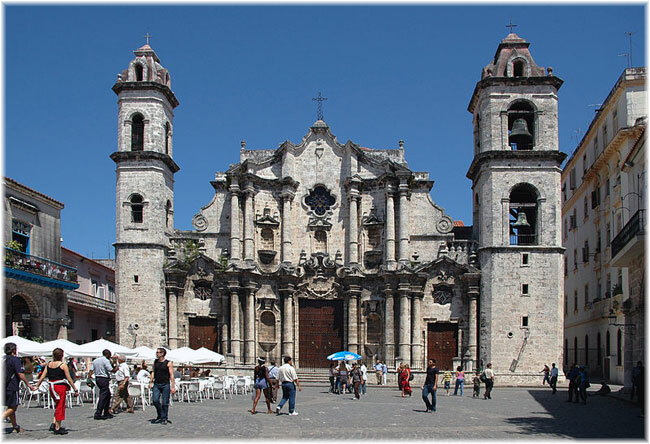 On the other side, Santo Domingo has deep Spanish roots and the Dominican Republic has the highest mountains in the West Indies. 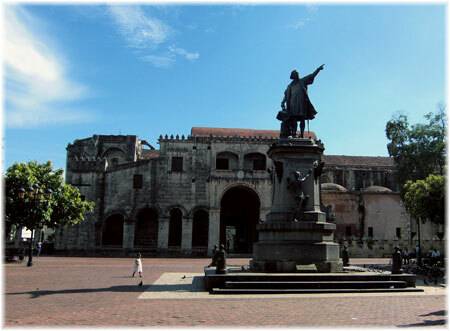 As well as the National Capital, Santo Domingo could boast of the burial place of Christopher Columbus, in its Cathedral at the Basilica of Santa Marta la Menor. Between 1936 and 1961, under the dictatorship of President Trujillo, the Dominican capital of Santo Domingo was known as Ciudad Trujillo, and for a time in the early 1950s the Republic even had its own cruise line, the Dominican Republic Steamship Line, which started by bringing in tourists from Miami, but switched to bringing in migrants in from Spain and the Canary Islands. In building a new cruise port at Tortuga, Carnival must ensure that islanders have realistic expectations about a development that may take years to materialize. No date has yet been set for any possible opening and the 65 square mile island has a population of about 27,500 but with few economic opportunities. Many locals commute to Port-de-Paix on the mainland for work. Royal Caribbean International has had its own “private island” in Haiti since 1986, when it opened Labadée, which is not an island at all but a closed-off part of the Haitian mainland. Royal Caribbean has contributed the largest proportion of tourist revenue to Haiti since then, employing 300 locals and allowing 200 more to sell their wares on the property for a fee. Royal Caribbean pays the Haitian government a levy of $6 per passenger it brings. Labadée’s attractions include beaches, a Haitian flea market, a water-oriented playground, a roller coaster and a zip-line. 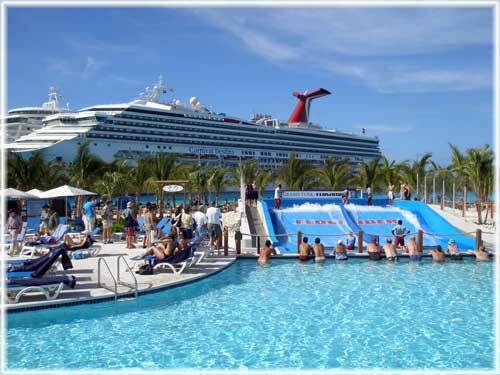 Meanwhile, another new port, the $85 million Amber Cove, a joint venture between Carnival and the Dominican Republic’s Rannik family, is expected to open in 2015. It has a mountainous backdrop, water sports and whale-watching opportunities, plus the cultural and historic attractions of nearby Puerto Plata, a once-vibrant tourist destination that saw regular cruise ships between the 1930s and the 1980s, excepting the war years. Carnival’s $55 million cruise ship centre at Grand Turk, meanwhile, which opened in 2006, will reach a million passengers this year, arriving on forty-three ships from fifteen different cruise lines. This facility has a beach, a large pool, a surf park, a Jimmy Buffet’s Margaritaville restaurant and bar and a large shopping centre. At this point that we should remember that a spokesman from Royal Caribbean recently cited Caribbean Tourism Organization research on the future of Caribbean cruise travel. The CTO found that while consumers consider on-shore activities to be more important than shipboard activities, culture and heritage rank much higher than a traditional beach experience. And while there is an increase in interest in shoreside shopping opportunities, authenticity is important. Whether or not all this can be bundled up into the new cruise ports is yet the open question. Pullmantur, Royal Caribbean Cruises’ Spanish-based Latin-focused subsidiary, has forecast a 9% increase in Spanish domestic cruise sales this year, while its Carnival-owned competitor Iberocruceros has been winding down its own activities in the Spanish market in favour of Costa Cruises. Overall Pullmantur is aiming to increase its sales on both asides of the Atlantic by 15% in 2015 and 30% in 2016. Pullmantur Cruises’ new president and ceo Jorge Vilches, appointed this May, has recently announced that it carried around 120,000 Spanish passengers last year and expects to carry 130,000 this year. Vilches was born in Spain and has lived most recently in Brazil. In total, the line expects to carry over 470,000 passengers this year and 520,000 in 2015. Of these, only 25% will be Spanish. The Spanish-based line’s dependence on Latin America is heavy, with Brazil contributing 125,000 passengers, Colombia about 30,000, Mexico 20,000 and the rest of Latin America 115,000. 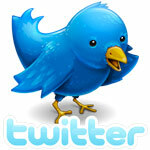 It has also opened its own offices in Brazil and Colombia. In a way, Royal Caribbean has succeeded in something Carnival tried in 1993-94, when its short-lived Fiesta Marina brand dedicated a ship to the Latin market and failed to develop a following. The main difference is that where Pullmantur is a developed brand Fiesta Marina brand had been formed by dedicating Carnival’s oldest ship to the Spanish-speaking market, something that smacked of second-hand treatment for Latino passengers. Some of Pullmantur’s success is expected to come from its new pricing policy. Vilches indicated that the prices were being “adjusted according to market demand”. Pullmantur announced that as of October 15, its “all inclusive” concept would be watered down. Its much-vaunted “all-Inclusive” program will now become a non-alcoholic one, including only tea, coffee, juices and water. Customers will then be offered a choice of two add-on packages. “All Inclusive Plus” will be €15 per person per day at the travel agent or €18 if booked on board. This plan includes the most popular brands of beer, wine and spirits and some additional benefits. “All Inclusive Premium” will cost €30 per person per day at the travel agent or €35 if booked on board. This plan will give passengers access to the most exclusive and prestigious brands. Meanwhile, the addition of the Monarch to Pullmantur’s Americas program underlines the line’s commitment to the New World. In the Caribbean, Pullmantur will introduce two new itineraries with cruises to Yucatan, Central America and the Bahamas. In Europe, Pullmantur will introduce a new “Midnight Sun” summer program, including Norway, Russia and the Artic Circle along with flights from Spain. To meet its 30% growth objective, Pullmantur anticipates taking delivery of a new ship in 2016 when Royal Caribbean’s Sovereign class vessel Majesty will be transferred to its fleet in addition to the Sovereign and Monarch that it is already operating. When delivered these were the largest cruise ships in the world. 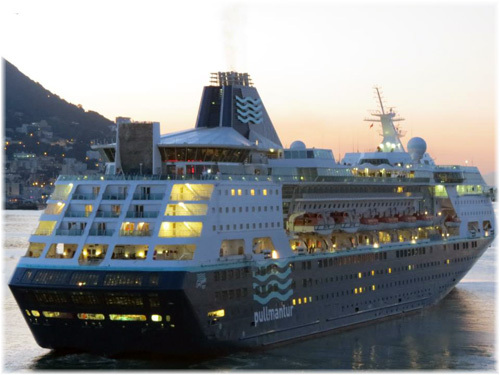 Meanwhile, Pullmantur’s French branch, Croisères de France, is expected to carry around 100,000 passengers this year. Having announced that the Celebrity Century would be introduced in 2015, she has instead been sold to Chinese buyers and Croisères de France will continue to with the ex-Celebrity sister ships Horizon and Zenith. In other areas, in a similar way to how Costa attracts passengers from English- and German-speaking markets, Pullmantur will increase its offerings to those markets as well as to other nationalities. Bottom line, it now appears that the two major cruise groupings, Carnival and Royal Caribbean, have settled their Mediterranean-based Latin operations on Genoa and Madrid, respectively. But while Pullmantur has been expanding into the Americas, Costa is now also expanding into China. 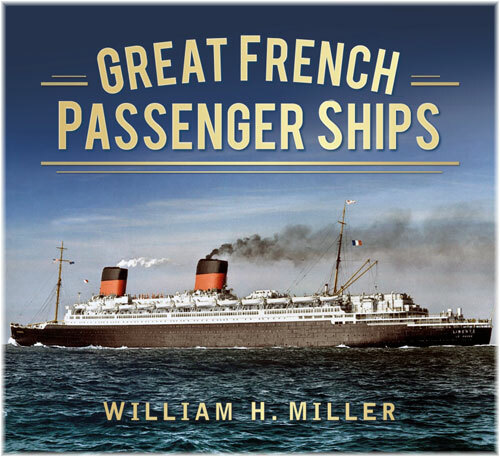 Maritime author William H Miller, known for having written over eighty books on passenger ships, has just produced his latest oeuvre, “Great French Passenger Ships,” recently published by The History Press. It is a follow-on in some ways to his “Passenger Liners French-Style” (Carmania Press, 2001). Concentrating on the last hundred years, Miller’s new opus, at 96 pages, centres its cover around the famous ships of the Compagnie Générale Transatlantique (CGT), otherwise known as the French Line. These included the France of 1912, Paris of 1921, Ile de France of 1926, Normandie of 1935 and the France of 1962, plus the post-war Liberté, which had been North German Lloyd’s Europa and was awarded to the French as a war prize. As well, the De Grasse gets her own chapter. This is an interesting inclusion as De Grasse was the only CGT Atlantic liner that had a shallow enough draft to get into Miami, which she did on many of her Caribbean cruises in the 1930s. Miller’s latest book also includes famous French ocean liners of other lines serving other seas – Sud-Atlantique’s short-lived L’Atlantique (1930-33), a victim of fire, Messageries Maritime’s Felix Roussel (1930) and Sud-Atlantique’s Pasteur (1939), which never traded commercially under the French flag. Curiously, though, no photo is included of the Pasteur after her later conversion to North German Lloyd’s Bremen in 1959. The subject of fire has to be covered of course, as the French passenger fleet had more than its share of losses by fire. As well as the Georges Philippar (1932), L’Atlantique (1933), Lafayette (1938), Paris (1939) and Normandie (1942), there was the Antilles of 1971 and several ex-French ships under new names and owners – identified by Miller as La Marseillaise (1961), Pacifique (1974), Laos (1976), Flandre (1994) as Pallas Athena. Ten fire losses over sixty-two years come to the total loss of another fine vessel every six years on average. Other French lines covered include not only Messageries Maritimes (the “M” in CGM after its merger with CGT) and Compagnie de Navigation Sud-Atlantique, but also Chargeurs Réunis, the Fabre Line and Compagnie de Navigation Paquet. Paquet was the last French cruise line of the old school to survive, operating the famous Mermoz until they were taken over by Costa Cruises in 1993. Aside from their newbuildings, the Ancerville and the Renaissance, Paquet also operated the ex-British cruise ferry Eagle as the Azur and the ex-Holland America Line Statendam as the Rhapsody, and both are included. An interesting photo in the chapter on Paquet is one of a crowded day in Malta, with Mermoz, Uganda, Queen Frederica and Taras Schevchenko all in port together. Miller makes mention of current French cruise lines, including Ponant, Croisières de France, Club Med and Paul Gauguin Cruises, but dismisses them as not flying the French flag. 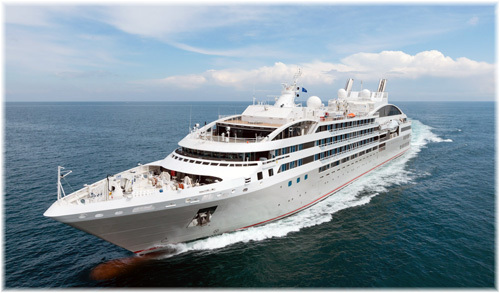 In the case of Ponant, however, the company prides itself on flying the tricouleur, especially today with its four new mega yacht expedition ships Le Boréal, L’Austral, Le Soléal and Le Lyrial, which have not only cruised to Antarctica but have also tackled the Northwest Passage. These ships may not be as large as the liners of yore but they maintain the French tradition in a cruise market that, after many years of stagnation, is finally beginning to show real signs of growth. One of Miller’s standard devices is the man-in-the-street type interview whereby he finds former passengers from the various ships he discusses and includes their impressions, good or bad, of the ships they travelled in. While many of these are Americans rather than French, this brings a human touch to the stories of these various ships. “Great French Passenger Ships” by William H Miller is available from The History Press at thehistorypress.co.uk.